Choose from our range of Irish Street Signs or personalise your own street name and we can make it up for you. Our signs look eye-catching on your wall at home or at work, or in an Irish pub, restaurant or club. This is a great idea for a gift for family and friends at home or abroad. Our signs look really authentic. The signs are 560mm x 140mm, you choose blue or green, old or new look and foamex or aluminium. All delivered with double-sided tape for easy fixing to walls. We have recently introduced our Finger post signs, choose from our range or personalise your own. 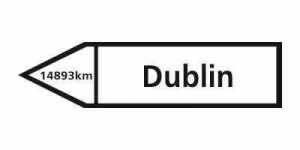 We can calculate the kilometers or miles from your start location to your end location. Available size 560mm x 140mm. Made with foamex and ready to fit, with double-sided tape included.